Now that summer is well and truly here we’ll be spending more time outdoors in our gardens. 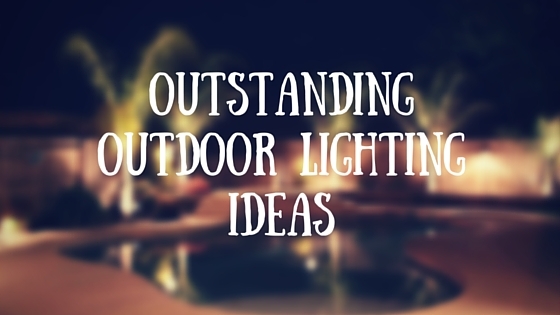 What better time than now to get some great outdoor lighting ideas. Whether that’s for a spot of al-fresco eating, lounging around soaking up the rays or playing games with the kids, our gardens will feature a lot in our lives over the coming months. This isn’t a problem during the warm daylight hours when the sun’s rays are beaming down and boosting our vitamin D count. But what about at night when it’s still warm enough to be outdoors and we’re seeking to create a different ambience? Evenings in our garden are about entertaining – whether that’s our family or having friends round for a small drinks party. They’re also about relaxing after a long day. Because of this, any garden lighting should aim to provide us with a sense of tranquillity, as well as security. In the case of the latter, no intruder will lurk in bushes when there’s strategically placed lighting to highlight him or her. lighting really comes into play. That could mean using task lighting to turn that rock garden of yours into a dazzling centrepiece to gaze on while dining on the patio. Then again perhaps you’d like to create that ‘floating outdoor furniture effect’ you’ve seen in restaurants via LED strip lighting? Whatever your aim we’ll try and point you in the right direction to make sure you get exactly the effect you’re looking for. Be warned though – reading this you’ll probably come away with a host of other top outdoor designer lamps you hadn’t even thought of – such as stunning table lights from renowned designers like Tom Raffield. In fact, we are sure there are many sensational scenarios you will be just buzzing to try out. Incidentally, you may be pleased to know that the majority of outdoor illumination these days is of the low voltage variety. Happily, this not only makes the lighting safer to work with but also far less expensive when it comes to your utility bill. Firstly though, just like indoors, the secret to great garden lighting is to ‘layer’ it. By that we mean employing several different types of lighting such as ambient, task and accent lighting. Ambient lighting – this is a form of lighting that doesn’t have any particular purpose but to create a mood. It’s like background music ie you know it’s there. Examples would be fairy lights strung on a fence or nearby tree. Task lighting – lighting which does have a purpose ie to light the stairway on a patio, the barbecue pit, or the stunning engravings on the exterior walls of your turn-of-the-century home. Accent lighting – this is used to feature a particular area of the garden, for instance, a central tree or your prizewinning flower bed. It usually involves deploying several floodlights. Remember too that by adding exterior lighting to your garden at night you’re not trying to emulate the beauty and colours of the garden as they appear in daylight. Instead, you’re attempting to bring into focus a ‘different’ garden. By this we mean there will be far more contrasts and a mix of both shadowed silhouettes and highlighted features. In this way, your garden becomes more of a mysterious place at night. To create this ‘other canvas’ we need those layers of lighting we’ve just mentioned. That’s because ‘washing’ the entire garden in just one form of light would lead to a flat and dull appearance and make it somewhere you definitely wouldn’t want to gaze on by nightfall. The best bit about lighting up your patio or decking area is that it helps blur the line between indoors and outdoors. This not only makes your home feel larger, but also gives you and your family far more living space than in the colder months. Incidentally, to get what lighting experts refer to as a ‘moonlighting’ effect, hang the lights around 30 ft high and just above the lower branches of a tree. This way the light will filter down through the leaves on the lower branches, creating a pattern of light and shadows. Consider using floor lighting too by fitting diodes to the decking. This way you won’t get any glare and it’s a much more subtle form of lighting (even if it does seem a bit disco-like). LED fairy lights. Candles create a romantic air for your outdoor dining table but there’s always the risk they’ll get knocked over and set something alight. These tiny fairy lights are one of our favourite outdoor lighting ideas. Scrunched up inside glass domes they create an ambient light, are far safer and well, just look so cute. Uplighting. Trees look terrific when lit from below since the light illuminates the trunk’s texture and adds softness to the foliage. Just make sure you do actually light up the trunk otherwise you get a bit of a ‘UFO hovering effect’ when it’s just the foliage that’s lit up. Floodlights (with a typical light width expanse of 40 feet) are better for tall trees (up to five bulbs of around 50 watts each). Bullet lights and spot lights have a narrow field and are therefore better for shorter trees (trees which are less than 20 feet tall only need a couple of 20 watt uplighters). In general this use of outdoor illumination gives you a great overview of the landscape in your garden. To make sure you don’t have to alter your lighting fixtures over the years as the tree grows, it’s best to buy above-ground outdoor lights which can be easily moved. Uplighting. Place the uplights behind the shrubs or plants. Ideally, if they’re nestled in mulch beds then hide the above-ground lights in these to make the display look neater. Place the outdoor pretty far apart too so that you get pools of light rather than a continuous flood of brightness. Lanterns at either side of your door of the house look great but make sure you don’t destroy what is potentially a charming feature by putting too bright a bulb in them. Think of door lights as being ambient rather than task-oriented. This way you’ll keep the light low so that it doesn’t glare into the eyes of night time visitors, causing them to squint every time you answer the door. If you’re fortunate enough to have columns or pillars in front of the door then light the back of those too. This will draw the eyes of visitors automatically to the door – and with an interesting sense of drama too. Spot lights. In order to create interest – and safety – when using exterior lighting to highlight a path in your back or front garden, use light on both sides and vary the distance between spaces. Keeping the lights uniform and symmetrical will make the path an unwanted focal point considering there is so much else to see in your garden at night. Meanwhile, putting lighting fixtures too close to a path could cause the lights to be stepped on and easily broken. To keep the landscape lighting looking subtle use lights which point downwards and remember too that moonlight provides extra assistance in leading the way. Really, you want your path lights to appear as ‘gentle hints’ rather than ‘directional arrows.’ Always keep them below eye level in order to avoid that unnecessary – and annoying – glare, again. If you have various shrubbery, plants and trees alongside your path then you could put lights in them to highlight the variety of shapes and colours. Downlighters. For a more subtle approach try hanging downlighters from nearby tree branches in the area of the water feature so that it becomes a mysterious part – rather than the highlight – of your garden. Highlighting a particular feature is known as accent lighting. It’s best to use warm light (ie with a ‘yellowish’ tinge) for this, especially if the object in question is a statue. That’s because warm light softens the features, as well as prevents glare and shadows. Use at least two lights so that the cross beam will cut back on any harsh shadows. LED bulbs are by far the most popular form of lighting around these days – for both indoors and outdoors. That’s because they’re not only more energy efficient (they use 80 per cent less energy than a traditional incandescent bulb), but they’re also less expensive in the long run. They also last far longer. Halogen bulbs are less efficient than LEDs but they are less expensive to buy initially. Many people still prefer the light from these bulbs to LEDs (which tend to offer either a ‘warm’ white or a ‘cold’ white). Lighting controllers can come in many forms, the most common being automatic timers, while wireless keypads and fobs allow you to control the lights manually. Even if your garden is tiny, you can still make your indoors seem larger by placing floodlights outdoors. That’s because the windows of your home will appear less ‘black’ and imposing. The floodlights will ‘open up’ the space. Don’t sit in your garden much? You can still make use of outdoor lighting in the form of a burglar deterrent ie to illuminate anyone lurking there. Don’t go overboard with path lighting so that it looks like you have a mini airport runway in your garden. Remember that moonlight can be pretty strong and provides effective lighting too. Using a light with a blue filter will make the green leaves of trees more intense colour-wise. As well as using landscape lighting to illuminate favourite areas of your garden, use the darkness to disguise those parts you dislike and need to attend to. To add depth to your home and garden, don’t just light up the house but the garden too – otherwise the building becomes very ‘stark’ looking. Spiked lighting fixtures make it easy to move the lights around when plant growth threatens to cloud out the beam. Make sure the beams from any spotlights you use don’t shine directly into a neighbour’s window! Coloured lights – and yellow in particular – are great for keeping away insects of all sorts. That’s because yellow (which is a lower coloured light) can often be difficult for the insects to see in the first place. But don’t use it to highlight shrubbery as it will make it look as if it’s dried out. When choosing your actual lighting fixtures, avoid items produced from iron because rain will cause these to rust over time. Instead opt for lighting made with steel, brass and copper. A patina may develop over time but they’ll last far longer and cost less since they’ll need replacing less often. Once you have your outdoor lighting in place the next thing to consider is its upkeep. In order to prevent lights from overheating it’s important they aren’t obstructed by leaves and overgrowing plants. If this does happen remove the offending bulb immediately to prevent the rest from suffering due to short-circuiting. Look out for condensation too – especially if you live in a rainy or cold climate such as the UK or Scandinavia. A good way to prevent this is to rub petroleum jelly on the base of the bulb on installation and every now and again over the years. In fact, check all bulbs several times a year – especially after winter. We hope you’ve enjoyed reading about the above outdoor lighting ideas and that our article has indeed sparked some interest for your own night-time garden plans. Or maybe it has helped rekindle an old interest which had dwindled – thanks to the over-proliferation of garden solar lighting in recent years? Or how about dual-purpose outdoor lighting LED cubes which double up as excellent seating? Whatever your exterior lighting needs you’re bound to find something that fits the bill – and at an affordable price, since the cost of LED lighting in particular is decreasing as time goes on. Then all you have to do is get those outdoor lighting ideas wired up and sit back while indulging in some expertly-illuminated night time al-fresco dining and entertaining. Enjoy! This article is totally on trend. Not just because we’re heading into summer and will be out more but because outdoor lighting can totally transform a property. I was lucky enough to find a home where the previous owners paid extensively for landscaping their front and back gardens and cannot tell you how much I enjoy looking at my house when I drive up to it even during winter months. When using outdoor lighting, you can ask a qualified electrician to make an installation using a wireless router which will create sections in the garden which you can then control with a very standard fob (ours has 4 sections: shrub and tree uplighters, rockery, deck, and around the fence of the garden). Such routers last 5-7 years depending on their insulation. Use led lights to last you ages and keep your electricity bill down. Bulbs come in a range of colours or you can have filters added on for blue, green or red lights, which make it perfect for rockery. Great article, so much useful advice! Great article, so informative! People often forget about lighting or put it at the end of their project but it should be one of the first things to think about since it is so important to any design! What a difference the right outdoor lighting can make in your landscaping! client often for get that half the time your beautiful yard is seen in the dark, or should I say, not seen. You should be able to enjoy it for a full 24 hrs. Not to mention the security it provides. Thanks for all the ideas. Hello Barbara, thanks for the comment. Yeah, certainly for this periode of the year, people should be able to enjoy their garden to the fullest!